Camp Bow Wow Hutto dog training services are specially designed to enrich your pup. Our premier dog training services offer flexible programs for every dog. The training methods we use are designed using only reward-based techniques to ensure your pup has the most fun learning experience. Our programs are exciting, effective, and enrich canines of all ages and behavior levels. One of our Camp Bow Wow Certified Trainers will work to design a program that meets your needs and your schedule. Contact Camp Bow Wow at (833) 364-5433 to schedule a session! Regardless of their age or behavior level, your dog’s health and happiness can be improved through enrichment activities. We provide numerous fun and engaging enrichment training programs that boast numerous benefits. Camp Bow Wow’s dog obedience classes are split into levels to help both you and your four-legged family member learn at a progressive pace. Our reward-based training methods will help ensure that your dog attains the level of obedience most pet parents only dream about. Level I—Basic: Builds the foundation of reliable commands like sit, down, leave it, come when called, and leash walking. Level II—Intermediate: Learn how to get your dog to heel by your side, go to their mat, and add distance plus distractions to all their behaviors. 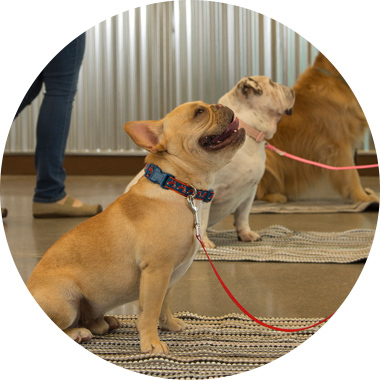 Level III—Public Polishing/CGC Prep: This level teaches your dog to sit when you greet a stranger, heel in a crowd, and more. They will now be prepared for the Canine Good Citizen (CGC) exam. Camp Bow Wow Hutto offers several options for our canine training. Our Certified Trainers can work with your dog while they attend Camp, spending one-on-one time with them. We can also provide training services working with you and your dog in a private setting if that’s most comfortable for you. These sessions can help your pup overcome behavior issues or provide enrichment.